This is the BEST ever Fluffy Pancakes Recipe! It’s our go to recipe for pancakes – they’re perfect every time! Thanks to buttermilk, baking powder, and baking soda, these pancakes bake up fluffy every time we make them. This is a keeper recipe for sure! Pancakes are a super indulgence for us. My daughter loves them so I love making them for her. I have tried all sorts of pancake recipes from books and magazines, I’ve tried every mix out there, and this easy fluffy pancake recipe is by far the best one ever. Making your own pancakes taste so much better than a mix and way better than frozen. In fact, I love to make pancakes and freeze them because I hate making breakfast in the morning. If they’re made the night before or in the freezer, all my daughter has to do is pull one out and heat it up. Getting the perfect fluffy pancake is a little bit of a science. The perfect pancake recipe is easy but also super fluffy. These start out flat but you can watch them rise as you cook them, resulting in a super fluffy and perfect pancake. How do you make your pancakes extra fluffy? There are a few components to making the best pancake recipe. You’ll notice this recipe calls for baking powder and baking soda. There’s a reason for that, and it’s why they’re so fluffy. 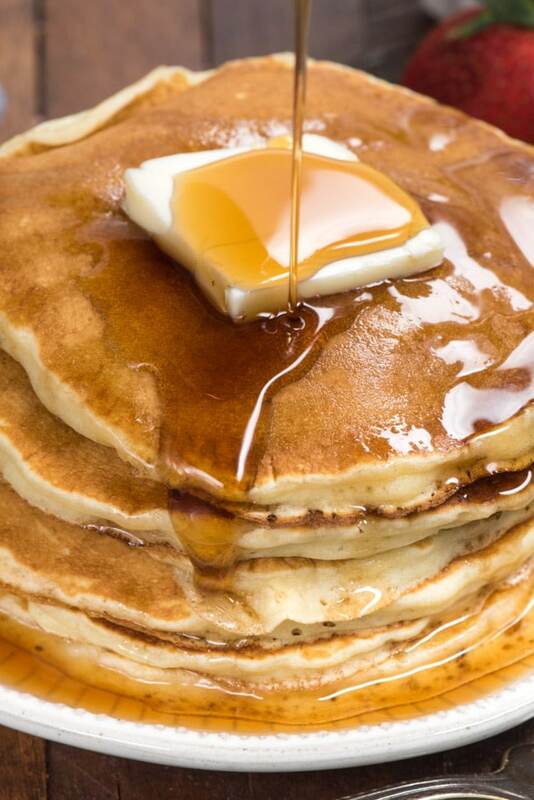 Baking powder is important to make your pancakes light and fluffy. Pancakes aren’t baked, but they’re still a form of cake, right? So baking powder, as in cake, will help the pancakes rise and be tender. Baking soda is also important, in this recipe. To work, baking soda needs to have a chemical reaction with an acid. During that chemical reaction, bubbles are created. Those bubbles expand during cooking, leaving a light and airy pancake. The buttermilk, or, in the case of this recipe, vinegar (or lemon juice) and milk. 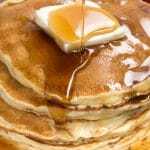 The combination of the acid in the buttermilk (or vinegar) reacts with the baking soda, causing the chemical reaction needed for the pancakes to be fluffy and perfect. What if I don’t have buttermilk and a recipe calls for it? I hardly ever have buttermilk in my refrigerator, but I always have milk. It’s easy to make your own buttermilk by adding lemon juice or vinegar to the milk. It sours the milk, making buttermilk. I wrote the recipe as if you are using milk and vinegar, but if you happen to have buttermilk, you can use it instead. The Best Fluffy Pancake Recipe is easy to make and is the most perfect homemade pancake out there! You’ll also notice that this pancake recipe is without butter. I do that on purpose: I hate melting butter. It’s a quirk I have, so I use vegetable oil. You can use melted butter or coconut oil if you prefer. This recipe makes about 8-10 pancakes, depending on size. You can add anything you like to the batter, like sprinkles or blueberries. How do you know your pan is ready to cook pancakes? You can do what my mom taught me: the water dance. Flick a bit of water on the pan. If it dances around (i.e. boils), your pan is ready. If it sits, let it heat up a bit longer. How can you tell when to flip a pancake? Once the pancake is cooking and the top is full of bubbles, you’re almost ready. Once those bubbles start to pop and the bottom is golden (take a little peek) then it’s ready to flip. If your pancake is browning before the bubbles form, turn the heat down on your pan or griddle. Important: baking soda reactions don’t last a long time. In order for these to be fluffy and absolutely perfect, cook them immediately. Don’t let the batter sit. Use nonstick cooking spray to make sure the pancakes don’t stick. Freeze between paper towels in a ziploc bag for up to one month. Reheat in the microwave. This is the BEST ever Fluffy Pancakes Recipe! It's our go to recipe for pancakes - they're perfect every time! If using milk, add vinegar or lemon juice to the milk and let it sit while you whisk the dry ingredients. Whisk flour, sugar, salt, baking powder, and baking soda. Add egg, lemon juice, milk (or buttermilk), and oil. Whisk until combined (batter may be slightly lumpy). 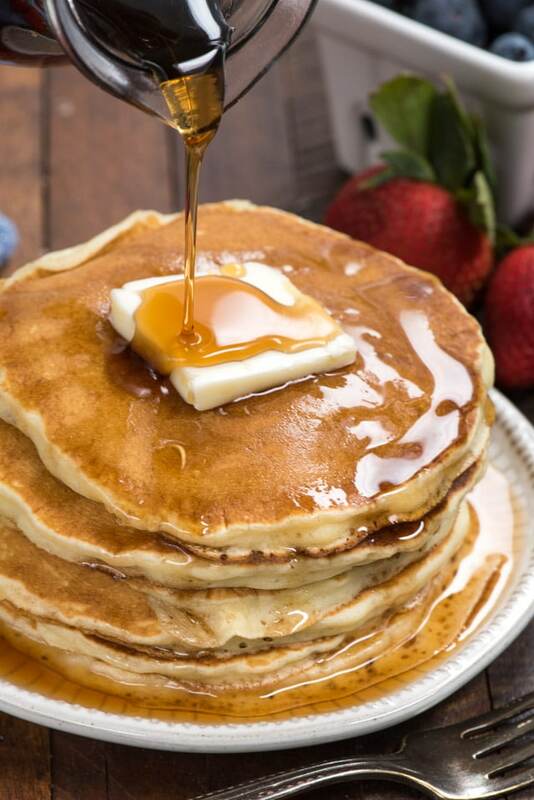 Cook pancakes immediately so the bubbles created by the baking soda don't dissipate. You'll know your pan is hot when the water dances: flick a bit of water on the pan. If it dances around (i.e. boils), your pan is ready. If it sits, let it heat up a bit longer. Cook pancakes, flipping halfway, on griddle or in pan greased with cooking spray. You know they're ready to flip when the bubbles form on the top and start to pop and the bottom is golden. Serve warm with syrup. You can substitute 1 cup of buttermilk in place of the milk and vinegar. If you don't have buttermilk, the vinegar or lemon juice helps sour the milk, making your own.